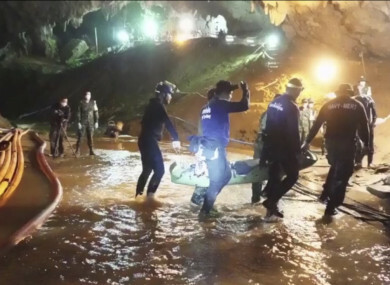 Rescuers hold an evacuated boy inside the Tham Luang Nang Non cave. THE UNPRECEDENTED MISSION to evacuate the “Wild Boar” football team from a flooded Thai cave finished on Tuesday after the final four boys and their coach were extracted by elite foreign divers and Thai Navy SEALs. The final stage of the complex operation, which has gripped Thailand and dominated global headlines, put an end to the 18-day saga that started when the team entered the cave on 23 June. Much-needed food and medical supplies – including high-calorie gels and paracetamol -reach the boys as rescuers prepare for the possibility that they may remain in the cave for some time. The last four boys and the coach are safely brought out of the Tham Luang cave in one of the fastest days of the 72-hour operation. The boys are expected to spend a week in a hospital in Chiang Rai and six months of psychological monitoring. Email “Thai cave rescue: A timeline of the mission that gripped the world ”. Feedback on “Thai cave rescue: A timeline of the mission that gripped the world ”.